Zoho Mail provides flexible options to migrate from Office 365 accounts. Mail, Contacts and Calendar data can be migrated from Office 365 accounts to Zoho Mail. The respective user accounts need to be created in Zoho Mail before adding the migration. Follow this link for detailed instructions on user addition. To migrate from Office 365 to Zoho Mail, the credentials of the Office 365 Administrator / User with the ApplicationImpersonation role is required. Impersonation is an access method, provided by the Office 365 Administrator to the member who is performing the migration. ApplicationImpersonation role will give the member access to user data. This access is required to migrate the user data to Zoho Mail. Go to Permissions and click the + symbol. This is to create a new Admin role. Enter a name for the respective Admin role. Click the + symbol under Roles. Select ApplicationImpersonation and click Add. You can now add the users to whom you want to assign this role. Under Users, click + and add the respective account. After you have added the users, click Save​. If you have just configured ApplicationImpersonation in Office 365, it will take a while for the changes to propagate. If you try to add a migration immediately after configuring, your credentials might fail. For detailed instructions, follow the Exchange Admin Center in Office 365 help page. Under Mail Administration choose Migration. Click Add Migration, to provide server details for migration. Provide a Migration Name for your reference. Select the Migration Protocol as Apps. 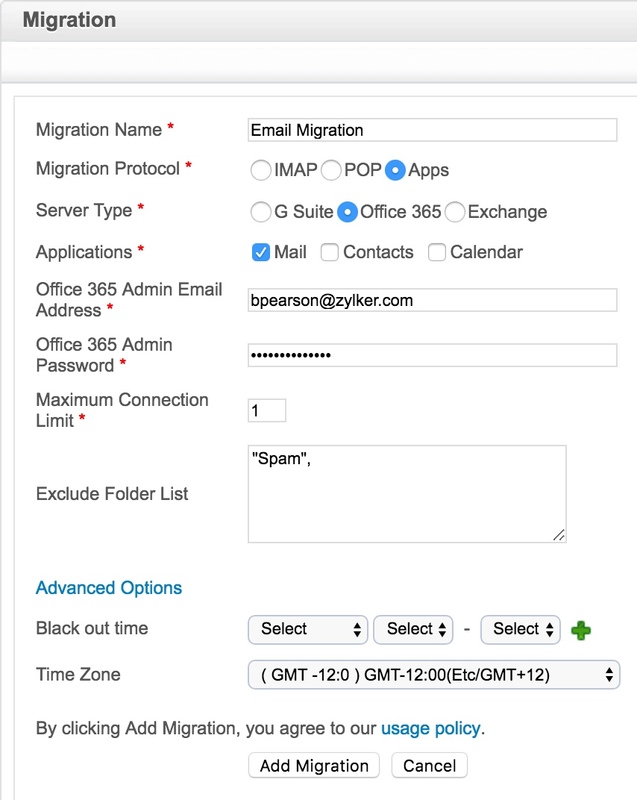 Select 'Office 365' to auto-populate the server details. You can also choose to migrate your Contacts and Calendar details along with your emails. When you select Contacts, all contacts from your previous account will be migrated to Zoho Mail under the relevant categories. Selecting the Calendar option under Data will create the respective calendars in Zoho Mail and migrate the data to each calendar. Ensure that the prerequisites are in check for Calendar migration from Office 365. Enter the Admin Email Address and the Admin Password of the source Office 365 domain from which you are migrating. In the Exclude Folder List option, add the list of folders that you want to skip during migration. Enter the names of the folders within double quotes ("Folder1"), in which case only that folder will be excluded. If you want all subfolders under a parent folder to be excluded, enter the folder name followed by /* within double quotes ("Folder1/*"). For detailed information on the convention, refer here. Click Add Migration to save the server details. You need to add the account details to be migrated as the next step. To ensure complete migration, all the users present in the respective Office 365 account need to be created in Zoho Mail before calendar migration. For the Calendar data to be migrated correctly, the domain name in Zoho Mail has to be the same as the domain name in Office 365. For example, if your domain in Office 365 is abc.com, your domain name in Zoho Mail should be the same. Select the Migration Name to which you want to add the source and destination details. Select Add Accounts to add the account details manually. Provide the Source username and the Destination to which the emails should be migrated. Enter the priority that you would like to set for this account's migration. In the Folder Option, you can choose either the All Folders or Specific Folders option. If you choose the All Folders option, you can choose to skip any folders during migration using the Exclude Folder List option. 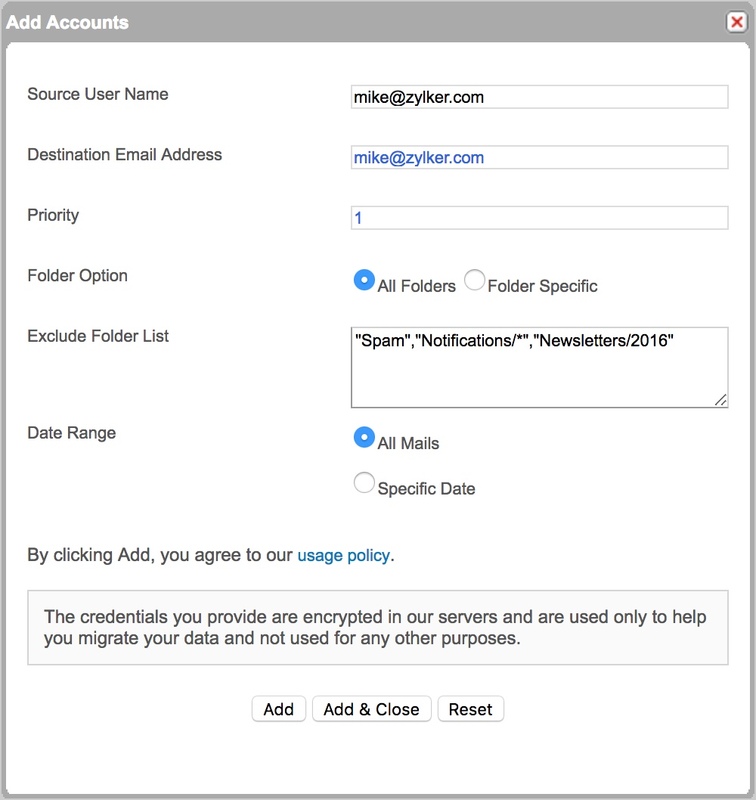 The skip folders option will be handy when the admin rerun migrations for the same set of users for some new emails or missed emails. Enter the names of the folders within double quotes ("Folder1"), in which case only that folder will be excluded. If you want all subfolders under a parent folder to be migrated enter the folder name followed by /* within double quotes ("Folder1/*"). For detailed information on the convention, refer here. If you choose the Folder Specific option, you can specify the folders that need to be included in the Include Folder List. In the Include Folder List, enter the names of the folders within double quotes ("Folder1"), in which case only that folder will be included. If you want all subfolders under a parent folder to be migrated enter the folder name followed by /* within double quotes ("Folder1/*"). For detailed information on the convention, refer here. The credentials will be authenticated with the source server provided, once you click Add. Repeat the steps until you add the last user for migration. Click Add and Close to close the popup and return to the Migration page. In case you want to mention a specific parent folder (E.g. Reports), enter it as "Reports". In case there are multiple subfolders under Reports and you want to mention all the subfolders, enter it as "Reports/*"
In case there exists a subfolder under Reports named 2016, and you want to mention this particular subfolder, enter it like this - "Reports/2016". If you want to mention all the subfolders under Inbox, only the Marketing folder without the subfolders, and a specific subfolder, 2012, alone under the Sales Reports folder to be mentioned, you will have to type the Folder List like this - "Inbox/*", "Marketing", "Sales Reports/2012". Instead of manually adding the users for migration, you can also add the user details to an excel sheet, save it as a CSV file and upload it. The user accounts mentioned in the CSV will be uploaded for migration. Click the Upload Accounts link in the Migration Accounts page. The format for entering the User Details in the CSV file will differ according to the type of migration that you've chosen. In the right pane of the Upload Accounts section, you will find a sample CSV file. Download the sample file, look up the details, and enter your user details accordingly. Choose the respective file and Click Ok to upload the accounts. The user accounts added will be listed in the Accounts section. Check whether all the accounts to be migrated has been listed in Accounts section. In all migration types, the source account and the destination account details should mandatorily be entered in the CSV file. In case there is an issue while uploading the users, another file with the error details will be downloaded automatically. 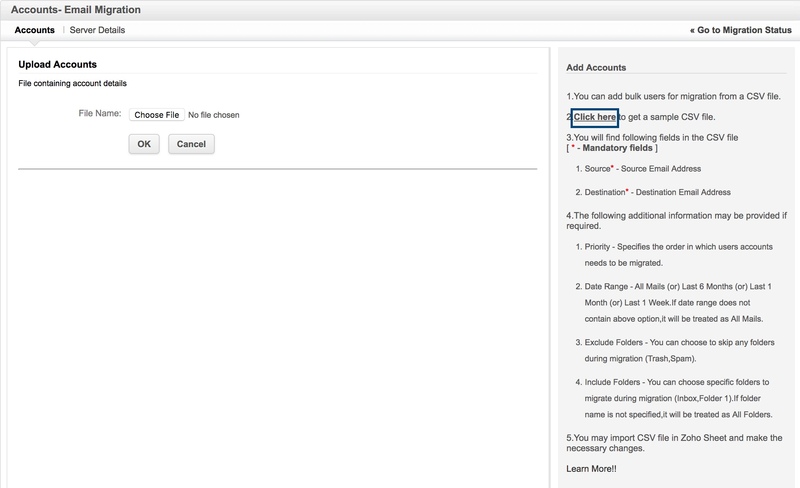 You can populate the account details in Zoho Mail directly from the source server. Click the Fetch Users option in the Migration Accounts page. You will be asked to install the Zoho Mail Admin app. Enter the admin credentials of the Office 365 account from which you are migrating. After following the steps as instructed, go back to the Zoho Mail Control Panel page, and click Next. You can remove the application access from your account at any time from the Migration listing. You can view the accounts that have been selected for migration. Select the Folder Options, and the Date Range for the selected users and click Add. To know more about the convention for mentioning folders, click here. In case, any of the user accounts that you have selected have not been created in Zoho Mail already, an error will be shown, and a csv file with the error details will be downloaded. You can create these accounts and then try fetching the users again. After fetching the required set of users, click Next. 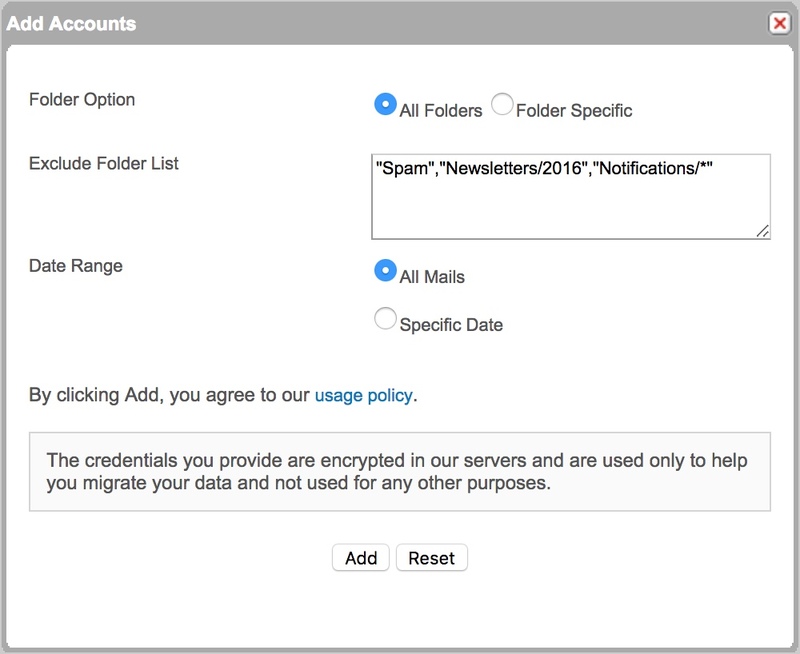 In the Control Panel, navigate to Migration under Mail Administration. You can add multiple migrations from different servers or from the same server for different sets of users to have a phased and planned migration. The list of migrations you have added will be listed in the Migrations page. Click 'Start' link, across the migration you have just added to start the migration. The Migration will be scheduled and the status will be 'In Progress' for the migration that is currently running. You can view the overall migration status in the listing, and detailed migration status in the Accounts section. Detailed reports along with folder information will be available. Click the count under the Total field to view the detailed information about the folder-wise migration details. The errors, if any, will be listed across each account. Click the Failed link to view the number of emails that have not been migrated, along with the reason for migration failure. Similarly, you can also view the statistics for Contacts migration by clicking the respective count under the Total category. The Calendar migration details can also be viewed from the same page. Click on the respective count under Total in the Calendar category to view the details. In case there are any failures while migrating contacts and calendars, click the View failure contacts or View failure calendars button on the top right portion of the window. For more information on reasons for migration failure, follow this help page. You can remove the access you have given for the application from the Migrations listing page. Click the Installed Apps option on the top right corner of the page, select the Office 365 option, and click Remove. Please ensure that there are no migrations in progress before you remove the application. You will have to install the Zoho Mail app and verify it again to add any further migrations.